Tonight and tomorrow the Tompkins County legislators are holding a pair of meetings on the proposed road law. Tonight’s an information meeting and tomorrow night is the public hearing. Up for discussion: an extension of the county code that would require non-permanent commercial and industrial activity generating heavy truck traffic on county roads to obtain permits for the roads they will use, and post bonds for potential damage. Legislators emphasize that the new law won’t have an impact on local contractors and businesses. The purpose is to regulate the kinds of heavy road use that has the potential to damage roads, such as large-scale construction projects, logging or gas drilling. They define high-impact truck traffic as more than 10 truck trips a day to or from a single project site, for more than three days in any given week. It also includes trucks with a gross weight that exceeds 20 tons. Local farmers won’t have to worry about milk shipments and feed deliveries because the law specifically excludes agricultural activities. Under the new law, managers of temporary projects would have to apply for permits that would designate their travel routes and any restrictions. The companies generating the traffic would have to submit documentation about the condition of roads before obtaining their permit, and they would have to post a bond. You can read a copy of the local law by going to the legislature's page and clicking on “Lla-11” (it’s a PDF). You can read a longer article on this issue in the January 31 issue of Tompkins Weekly. The information meeting is tonight, 7 pm in the first-floor conference room of the County’s Old Jail office building on 125 E. Court Street in Ithaca. The public hearing is tomorrow, February 1 at 5:30 pm in the Legislative Chambers of the Tompkins County Courthouse at 320 North Tioga Street in Ithaca. Yesterday Pennsylvania House member Phyllis Mundy introduced a bill that would place a moratorium on issuing new permits for drilling in the Marcellus Shale. 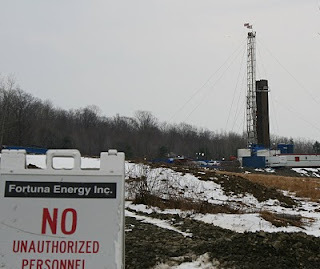 House Bill 233, titled “Marcellus Shale Natural Gas Drilling Permit Moratorium Act” would establish a one year moratorium on Marcellus permits in order to “provide additional time to enact and approve appropriate laws and regulations to protect the public health and safety”. It’s not a long bill – only 215 words, and that includes definitions and title. You can read it here. Liz Hayes of the Valley News Dispatch reports that the town supervisors of Upper Burrell (east of Pittsburgh, PA) aren’t ready to approve their gas-drilling ordinance just yet. Residents, offering numerous suggestions at Monday night’s public hearing, asked their town officials to delay approval of the ordinance until more of their concerns could be addressed. According to Hayes, the supervisors didn’t vote on the proposed law but remarked that they would have to pass the ordinance soon. They want regulations, even if imperfect, in place soon. The ordinance would prohibit Marcellus wells from all areas of the township except for residential/agricultural and industrial zones. But, the law would require companies hoping to drill in an area zoned RA to obtain a special exemption. You can read Hayes' more detailed report of last night's public hearing here. You don’t have to have drilling in your town – or even in your state – to experience heavy truck traffic associated with drilling. At least that’s what residents of Owego, NY are learning. Last month the Owego Village Board discussed plans for selling wastewater to drilling concerns – a business opportunity, for sure, but one that will bring in a lot of additional water-hauling trucks. 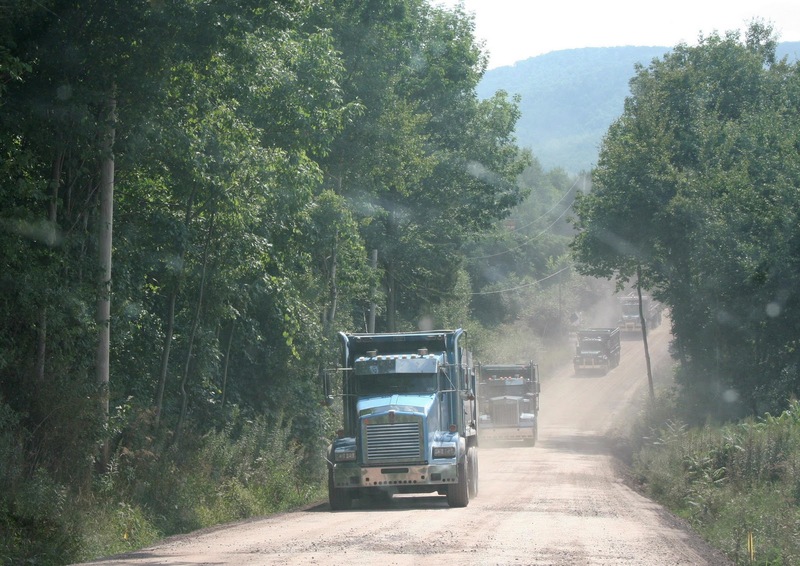 Then, earlier this month Mark Clark, Town of Owego highway superintendent, reported that Talisman Energy has expressed a great desire to use four of the town’s roads. The company is looking for access to drilling sites in Pennsylvania, just across the town border. According to my colleague Patricia Bence, Talisman has asked the town for permission to use four roads to carry 700 of their tri-axle trucks full of gravel for drill pad construction. Once the proposed well is operational, Talisman explained that heavy tanker trucks would haul water to the well, and frack-and waste-fluid from the well. The problem, says Clark, is that the roads can’t take the weight. He urged the town to get a bond to insure that Talisman repairs any damage. Given that the county and neighboring towns have been moving on a multi-municipal road agreement at a snails pace (or as my mama used to say, “slower than molasses in January”) it looks like Owego-ites will have to fend for themselves if they hope to keep their country roads drivable. You can read Bence’s full article here. The influx of drilling rigs and gas field workers in the Pennsylvania’s northern tier has led to an unanticipated housing crisis. At least that’s what James McRath, executive director for Bradford and Tioga County Housing Authority says. “The continued influx of workers from Texas, Oklahoma and Arkansas places increased demand on the already limited availability of local housing,” he told the PA Senate Urban Affairs and Housing Committee last September. Middle class and lower income families, McRath says, are being squeezed out of the market as rents have tripled – sometimes quadrupled – what they were before the gas rush. Two bedroom apartments that rented for $400/month just a few months ago now cost $1200/month. A quick check of classified ads in Towanda area newspapers show one bedroom apartments going for $800/month, a one-and-a-half bedroom for $1250 and a 3-bedroom apartment for $2250. The later includes utilities and internet. The problem: working class families can’t compete with the money out-of-state gas workers bring to the housing market. Landlords are eager to cash in on the boom, raising rents and even evicting long-time tenants. And that’s leaving some folks out on the streets. The regional homeless rate has increased 20 percent over the last year, said James Meehan. He’s the Regional Housing Coordinator for Futures Community Support Services serving Bradford, Lycoming, Susquehanna, Sullivan, Tioga and Wyoming counties. Instead of heading home after work, many people are bunking with relatives, renting substandard housing, getting a second job to pay rent, or crowding four people into one bedroom apartments. Some are living in campers or sleeping in cars. The lack of housing is especially tough on children, and Bradford County Child Services reported a ten percent increase in placement of children in foster homes from November 2009 to September 2010. One solution is to build more housing for gas field workers – and Chesapeake has done that. They recently completed worker dormitories, their “man-camp” near Athens, PA. But it’s not just gas field workers who compete for local rentals – once business owners see an increase in demand for their goods or services, they try to relocate in Marcellus areas, too. Just a bit over two months ago my colleague Peter Mantius wrote about the intent of industry to turn salt mines adjacent to Seneca Lake into LPG storage caverns. The New York State Department of Environmental Conservation (DEC), as Lead Agency for the Finger Lakes liquefied petroleum gas (LPG) storage project, has determined that the scope of the proposed action and its potential for significant adverse environmental impacts is such that a draft Supplemental Environmental Impact Statement (DSEIS) should be prepared. A Draft Scoping Outline for the DSEIS is available for review here - but if you want to comment, you'll need to hurry. Comments are due by the end of the month. Finger Lakes LPG Storage, LLC proposes to construct and operate a new underground liquefied petroleum gas (LPG) storage facility for the storage and distribution of propane and butane on a portion of a 576 acre site located on NYS Routes 14 and 14A west of Seneca Lake in the Town of Reading, New York. The storage facility will utilize existing caverns in the Syracuse salt formation created by US Salt and its predecessors' salt production operations. As proposed, a maximum of 2.10 million barrels (88.20 million gallons) of LPG will be stored in these caverns seasonally, displacing some of the brine currently filling them, and will be withdrawn by displacement of propane by brine when demand occurs during the heating season and displacement of butane by brine during the gasoline blending season. During storage operations, the brine displaced by LPG will be stored and contained in a 14 acre lined surface impoundment with a capacity of 2.19 million barrels (91.98 million gallons) on the hillside immediately east of the junction of Routes 14 and 14A. The facility will connect to the existing Teppco LPG interstate pipeline, and will ship LPG by truck via NYS Routes 14/14A and rail to the existing Norfolk and Southern Railroad. As proposed, the project involves construction of a new rail and truck LPG transfer facility, consisting of a 6 rail siding capable of allowing loading/unloading of 24 rail cars within 12 hours, and a truck loading station capable of loading 4 trucks per hour. The rail/truck loading facility is capable of being operated on a 24 hour basis 365 days a year. Construction will also include surface works consisting of truck and rail loading terminals, LPG storage tanks, offices and other distribution facilities, and stormwater control structures. A draft scope is available for review and written comment by involved and interested agencies and the public. Copies of the draft scope can be obtained from the contact person listed below and on the New York State Department of Environmental Conservation (NYS DEC) website at: http://www.dec.ny.gov/permits/6061.html. The end of the comment period on the draft scope is January 31, 2011. For more information about this please contact David L. Bimber at 585-225-3401 or dlbimber@gw.dec.state.ny.us. 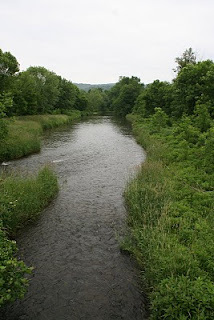 The Delaware River originates near Hancock, NY and travels 330 miles through Pennsylvania, New Jersey and Delaware before spilling into the Delaware Bay. The river basin drains 13,539 square-miles of watershed, some of it providing the drinking water for millions of people in New York City and along the east coast. Like the Susquehanna River Basin Commission, the Delaware River Basin Commission (DRBC) regulates water withdrawals from the Delaware River and its tributaries. And just like its sister-commission, DRBC is made up of state governors and a federal representative from the United States Army Corps of Engineers. At the beginning of last month DRBC released draft regulations that, they say, are intended to protect minimum stream flows, provide a record of water transfers, and ensure that downstream water resources are not adversely affected. The new rules also regulate how drilling waste fluids and other wastewater may be reused in gas development projects. Proposed regulations will permit the use of flowback and production fluids (brine), mine drainage wasters and treated wastewater for use in drilling gas wells. But, says DRBC, these “recycled” fluids will be monitored closely, using a system of manifests for each load shipped. A quick review of DRBC’s proposed rules indicate they will restrict drilling in flood hazard areas, on steep slopes and in areas deemed critical habitats for threatened and endangered species. They will establish minimum setbacks from rivers, wetlands and lakes as well as domestic water supplies and homes – and they call for pre-and post-drilling monitoring of surface and groundwater near well pads. Before trucking drilling waste fluids to a public wastewater treatment facility, drillers will have to demonstrate that acceptance of their waste will not interfere with the facility’s operation. They must also show that effluent discharged from these facilities will not exceed Safe Drinking Water Act standards. Drillers will have to pay to play, too. Under the proposed rules, drillers in the Delaware River Basin will need to post a $125,000 bond for each well to cover the costs of plugging, abandonment and restoration and the remediation of any pollution from gas development activities. That’s a big drop from the $5 million initially proposed, but still a lot higher than the $2500 Pennsylvania drillers are required to post for a single well. Good as they sound, these regs are a bit premature. Why didn’t DRBC wait until they complete their study on the cumulative impacts of drilling in the basin before offering a regulatory pathway to drilling permits? Why not wait for NY Department of Environmental Conservation to complete their review of high volume horizontal fracking before releasing the regs? The public has until March 16, 2011 to comment on the proposed rules, and DRBC has promised to schedule three public hearings (dates still to be announced). Comments may be submitted using a web-based form on the DRBC web site here. Mail written comments to Commission Secretary, DRBC, P.O. Box 7360, 25 State Police Drive, West Trenton, NJ 08628-0360. DRBC will also accept written comments at the public hearings. Today the Pennsylvania Department of Environmental Protection (DEP) announced that it has fined Chief Gathering LLC, of Dallas, Texas (a subsidiary of Chief Oil and Gas) a $34,000 fine for illegally discharging industrial waste in Lycoming County. 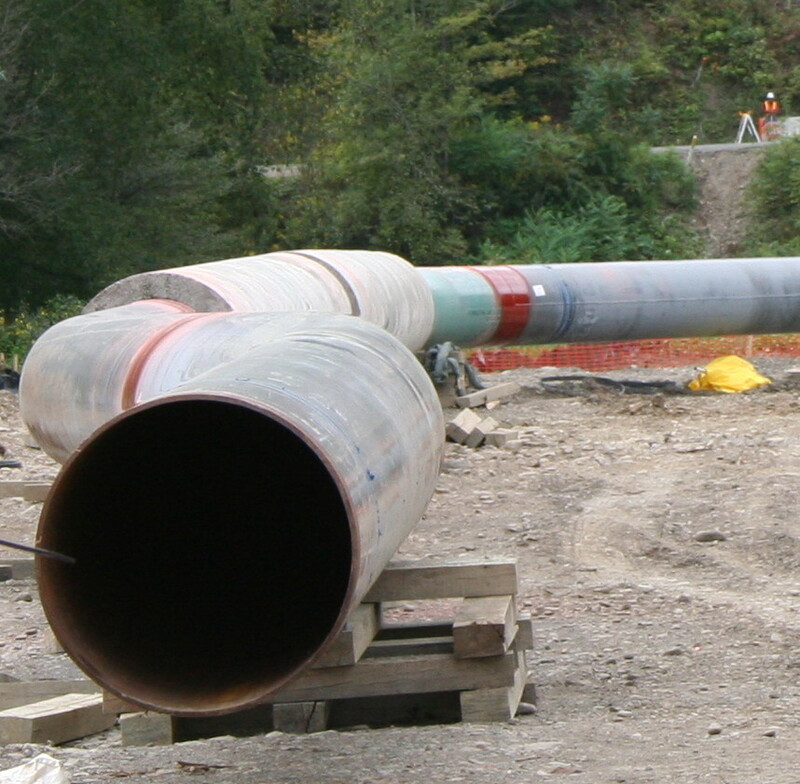 In August 2010 Chief was conducting hydrostatic testing at a pipeline project. 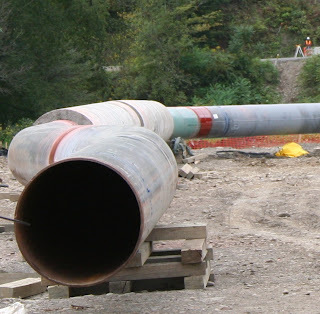 Hydrostatic tests involve placing water in a natural gas pipeline at the required pressure to ensure there are no leaks before it is placed into service. A failure to monitor the discharge for the specified effluent parameters at the minimum frequency required. In conjunction with the enforcement action, Chief voluntarily surrendered its discharge permit in early December. Today the PA Department of Environmental Protection announced that it has fined Talisman Energy (formerly known as Fortuna in these parts) $24,608 for a large diesel fuel spill that occurred in March 2010 in Bradford County. The spill happened at the Putnam 77 Marcellus natural gas well pad in Armenia Township. According to DEP North-central Regional Director Nels Taber, the diesel spilled off the well pad and into a neighboring farmer’s field. “Talisman is extremely fortunate that it did not impact surface water or wetlands,” Taber told the press. The company reported the spill to DEP, but has been unable to explain the cause. According to the DEP press release, discharging the diesel fuel without a permit violates the Clean Streams Law, and failing to manage the waste properly violates the Solid Waste Management Act. Cleaning up the spill required the excavation and removal of 3,800 tons of contaminated soil. It also meant collecting some 132,000 gallons of contaminated water - from which 450 gallons of diesel fuel was recovered. You can read the DEP press release here.